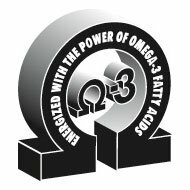 FlaxLic® 25-12 contains a high level of Alpha-linolenic acid (ALA), an omega-3 fatty acid. FlaxLic 25-12 contains 15% fat, which is derived predominantly from flaxseed and edible linseed (flaxseed) oil. FlaxLic 25-12 also is highly fortified with essential vitamins and minerals. This unique supplement is the first low-moisture block to contain a high level of ALA. This block is produced using a state-of-the-art patented process that provides a unique 24-hour feeding system. FlaxLic 25-12 is an exceptionally dense all-weather block that will give you the most for your money. Minimal Labor: MegaLic® FlaxLic 25-12 is convenient and easy to feed. Simply place an adequate number of blocks in areas that are accessible to the cattle. ML FlaxLic now has a U.S. Product and Process Patent for elevating Lipid Blood Levels in Livestock. The new MegaLic manufacturing process patent alters fats and improves the conversion of alpha-linolenic acid (ALA) to eicosapentaenoic acid (EPA).